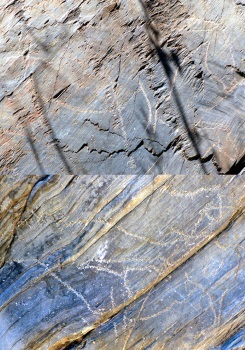 The Prehistoric Rock-Art Sites in the Coa Valley and Siega Verde date from the Upper Palaeolithic (22,000-10,000 BC) and are considered a masterpiece of prehistoric art. They were discovered in the late 1980s. The Coa valley site is composed of a group of 16 rock art and settlement sites spread over some 17 km of the lower Coa river valley. 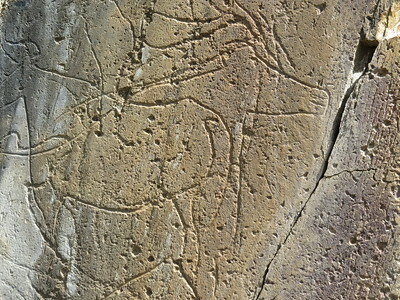 The site was extended with similar rock art 60 km away, in the Siega Verde just over the border in Spain. I almost failed twice in visiting the Coa Valley Rock Art WHS. In 2002 I was all set to go with a confirmed tour booking, the only way to get into the WHS core zone, when I received an e-mail a few days beforehand that the site had been flooded. All visits were cancelled. On my next try, in March 2016, I enquired about a tour a week before and was told that those on Saturday were fully booked! The PAVC gave me a list of private tour companies that also arrange visits (at considerable cost I am afraid). Fortunately I was able to change to Sunday, and they had spaces left for that day. Phew. I could not imagine having to travel to this corner of Portugal for a third time just to see one left-over WHS! In hindsight this one day delay proved to be a blessing during the Easter weekend: Sunday was the only bright day between two days full of rain. So I drove happily for 2.5 hours to this far corner of Portugal, once again passing the Alto Douro WHS which I had already ‘ticked off’ in 2002. I had planned a couple of stops to improve the photos of that WHS on the website, but there’s hardly anywhere to stop along the way. I arrived at the Côa Museum about noon. One wonders what lay behind the decision to build such a huge modernist structure for what probably always will be a minor tourist attraction. Having found my way to the reception in what appears to be a dark and moist basement, I was happy to discover my name on the list for the tour that afternoon. Nothing could go wrong now! First I explored the museum, which does a good job to explain the basics about the rock art of this region. They also display several replicas and colourful wall panels. The restaurant downstairs seems to be more popular among locals than the museum. Numerous extended families were celebrating their Easter lunch here. It is a bit upmarket (it certainly feels that way), but at 13-14 EUR for a main dish the prices are reasonable. I had bacalhau (cod), the staple of Portuguese cuisine. From the restaurant’s garden there are great views over the Coa Valley, which I found more spectacular than the Alto Douro Valley. For my encounter with the actual rock engravings I had a booking for the Penascosa tour at 14.30. This starts from the village of Castelo Melhor, some 15 minutes further into the valley. Driving there the scenery gets more and more impressive along the way. Castelo Melhor itself is cute too, you can easily spend half an hour or so here before the tour starts. Penascosa is one of the 16 inscribed Portuguese locations comprising this WHS. It was created 25,000 – 17,000 years before present. The site has 10 engraved rocks, which are only covered with animal figures. Together with 7 other participants (all Portuguese), a guide took me down on a bumpy ride in a 4x4 to the Coa River. I must commend this female guide that she kept on explaining everything in both Portuguese and English during the whole 1.5 hour tour. It might have been the soft Spring sunshine or the excellently chosen timing of the guided tour, but to my surprise the engravings were clearly visible (and even photographable). They're found on rocks close to the river, there's another group of rock art across the water - it is said that the location was kind of a valley entrance. The guide also had brought a book from where she could show the individual carvings, separated from each other. On many rocks the carvings are made on top of each other so it is sometimes difficult to see which limb belongs to what animal. Some carvings also supposedly show movement of animals: a horse with 3 heads is explained this way. I truly enjoyed my afternoon in the Côa Valley. This is a really well-kept WHS. The Portuguese have installed 24 hours a day (human) site surveillance at each of the separate locations. This upkeep comes with a cost, to which visitors only attribute 10% (the government has to chip in for 83% of the budget). 41,087 people reportedly came last year, but that may be the visitor number of the museum (the guided tours seem to attract a lot less attention). It also is a remarkable WHS as it is one of the most ancient man-made sites on the list: Côa has the oldest petroglyphs discovered in the world so far and is just slightly younger than the Altamira Cave (which contains rock paintings/pictographs). As some of the previous reviewers have commented, the Coa Valley Rock carvings are situated at the end of some pretty winding Portuguese roads. The extension in 2010 to include a Spanish location at Siega Verde gave us the chance to fit in a visit rather more easily, with only a relatively short diversion off the natural route we were taking anyway between Salamanca and Caceres. Despite that, I note that no one else has reviewed this extension yet. As usual we tried to make use of all available information when planning our visit – but, as often happened in Spain, the available arrangements were not entirely as advertised! Siega Verde is situated a few kms north of Cuidad Rodrigo on the main Salamanca – Portugal highway (A62). A prompt start from our Salamanca hotel meant that we were at the visitor centre a bit before 10 am when it was due to open, having covered the 100kms in under an hour. If you are planning to visit then check the “Horario and Tarifas” page of the Web site (http://www.siegaverde.es/index.php/horario-y-tarifas ) very carefully as the number and timing of visits varies by week and day and, outside August, they tend only to be available around week ends. The “macro-plan” for our trip had targeted Friday and the calendar on that Web page clearly showed a trip at 11 am for our Friday in Sept 2015. Unless earlier telephone or web bookings had filled it up we could expect to be ok and, although there was also a 12.30 tour as a “back up” if required, we really did need to get on the road for the 2 hour drive to Caceres to try to see that town in the afternoon and evening. The evening trips at 5 and 6.30 would be of no use to us at all. But the visitor centre looked decidedly dead as 10 became 10.30 with still no movement! It is perhaps worth making it clear that the nearby area of rock art sites is completely surrounded by high fences and video surveillance – there is absolutely NO opportunity to see anything by oneself or by looking through protective cages. At around 10.45 someone came and explained that, for reasons which were unclear to us (but turned out later to be a lack of staff), there would be no 11 am trip and that the first was at 12.30 – and there were at least 8 people waiting. We got our ticket however (normal price Eur 6 but 4 with reduction)! Luckily we were able to make good use of this enforced “free time” with a visit to the Real Fuerte de la Concepcion, situated 15 kms away towards the Portuguese frontier This happens to be a part of Spain’s T List entry of “Bulwarked Frontier Fortifications” (as also is nearby Ciudad Rodrigo which we also fitted in despite our loss of time at Siega Verde!) and proved interesting both in its own right and for the fact that it has been turned into a “luxury” (their description!) Hotel by the Domus Group (see http://www.hoteldomusrealfuerte.com/EN/history.html ). The receptionist, dressed as a British army officer of the Wellington era (though “he” was actually a “she”!! ), was very welcoming even if we didn’t even buy a drink! We returned to discover that the numbers for the 12.30 visit had reached the limit of 12 and the 10 Spaniards were shown a video (we saw an English version after the visit!) telling the story of the peoples who created the rock art via the concept of a “dreamed” return of one of them – quite nicely done for what is, after all, a very small “attraction”. Morning and afternoon visits apparently go to different sets of carvings to make best use of the light but all are within 500m of the visitor centre from where one descends to a rocky river valley. Each visit takes in 4-5 locations and lasts about an hour. Our guide kindly added some explanations in limited (but perfectly acceptable) English to his Spanish ones and I don’t think this detracted from the visit for the Spaniards. The carvings range from relatively clear to quite difficult to make out and the guide used a reflector to shine extra light and bring out the markings - all were visible when one got one’s eye in (though, looking again at my photos, some of them have almost “disappeared”)! Some are done by percussion and others by abrasion and scratching, some are of shapes but most are of animals (we didn’t see any of humans though apparently there are a few) and it is this aspect for which the location is particularly famous (photos). No colouring was visible and it wasn’t fully clear even to scientists if any had been used. This was to be a holiday of “Rock Art” for us, with further visits to 2 of the Mediterranean Basin Rock Art WHS sites at Valltorta and Albarracin (we didn’t bother to revisit any of the “Altamira and Cave Art of Northern Spain” series!!). Although they all cover different historical periods and all “need” to be seen, looking back, I perhaps would place Albarracin as being the more satisfactory visit, largely perhaps because one can visit the rock art by oneself but also because of their visibility, colour and (to us at least) their artistic value. Though it should be said that, in this comparison, Valltorta didn’t have a chance because it was closed when we arrived - though we, nevertheless, had an interesting visit which I may get round to reviewing. I did try to get to the bottom of the basis on which Siega Verda had been added to the already large Coa Valley site around 60kms away. The guide asserted that these carvings were indeed different from those at Coa but, in limited English, I couldn’t gain an understanding of why or whether this was just “Spanish nationalism”! Clearly Spain has done well to ride on the back of Coa to gain this inscription which, in a country where Rock Art sites are very common, would probably have failed to justify inclusion on its own. Both sites date generally from the Upper Paleolithic - c 20k to 15k ybp. The AB evaluation by ICOMOS satisfies itself on the fact that the Siega Verde extension does indeed bring complementary factors to the overall inscription in terms of period, artistic style and the fact that it is “open air” rather than “cave based” (the AB uses the phrase “A cave without a roof”!). As we didn’t visit Coa I can’t comment and perhaps that location still really needs to be visited by us even if I have “ticked off” the WHS itself! As we have seen all Portugal’s other WHS maybe that will have to await a cruise on the Douro in our dotage. I visited this WHS in August 2014. It's the first WHS I visited while in Portugal and it was quite an achievement to get there by car. 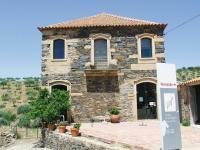 The winding roads are in very good condition and the Coa Museum is a modern structure perched high up above the valley. There are enough parking spaces even for the summer months as I don't think it is ever packed with tourists. Having visited the rock drawings of Alta in Norway and the ones in Valcamonica in Italy, I thought that this transnational WHS was their equivalent. Well, I'm afraid to say that it definitely wasn't. I'm still happy that this WHS made it on the list if this meant preventing an industrial plant or a useless dam being built instead. The landscape is gorgeous and it's a beautiful continuation of the Alto Douro WHS. The engravings of the Coa Valley are extremely fragile and most of them are very small and hard to appreciate without a magnifying glass and good sunlight. Some examples were on display inside the Coa Museum and even with a magnifying glass and good lighting it was difficult to appreciate them. I went on a morning 4x4 tour to the sites of Penascosa and Canada do Inferno and did a long hike to the Vale de Cabrões site to see the deer engravings on Rock 1 which turned out to be the most visible engraving of my visit (picture). Perhaps filling them in with red ocre (like they did in Alta) would help to be able to better appreciate the engravings even though I suspect that most of them are to small to be filled in! So on the whole I'm glad I visited one of the most remote WHS in mainland Portugal but I don't think I will be visiting again any time soon! The rock engravings are difficult to see and nowhere near as stunning as those of Alta (Norway) or Tanum (Sweden). However having reached Pocinho by train, it was only a short ride by minibus to Vila Nova de Foz Coa. Here I visited the Archaeology Park office and manged to arrange a visit to the Penascosa site. This involved taking the same minibus to Castelo Melhor, a village about 10 km away. From the reception centre in the village I joined a guided tour (costing 7 euros) by 4WD down into the valley to see a number of the engravings. Coa river is an affluent of the Douro river and so, a visit to the Coa Valley is obviously easy to achieve for any visitor that arrives in Oporto. For those who like beautiful landscapes is a place that will be for sure a good destination. As happens with some places in Spain (Seville, Toledo, Cordoba, etc.) the visitors are acknowledged to avoid months of severe temperatures (July and August). 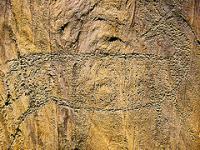 The rock drawings open to the public are split up into three areas, which you have to book separate tours for. Each trip involves a very bumpy 4WD ride into the valley. Be on the lookout for the guards and their very friendly dogs (in fact, watch out for dogs anywhere in Portugal, from what I've seen)! The most popular site is Ribeiro de Piscos - it had the clearest drawings and was the least strenuous walk (for people concerned about such things). Canada do Inferno was the more challenging of the three, with the fewest drawings; although it was a beautiful scenic walk and my husband and I were the only ones on the tour, which made it worth the effort anyway. The tour guides were excellent and were very helpful in pointing out drawings that were at times very hard to see. They answered every question we had. I would recommend going in the cooler months - we were there in early November and the weather was almost perfect (one day it rained, but literally just when our tour of Ribeiro de Piscos was finishing). The guides told me that because the Coa Valley is a microclimate (hence the profusion of olive groves and wineries) it gets extremely hot and dry in the summer. So much so, that tours of the drawings are only run in the mornings during the summer. We stayed in Figueira de Castelo Rodriguo, a lovely town in itself which is about 45 minutes' drive from the furthest of the three sites. We didn't have a car, but got around to the sites fairly easily with taxi cabs and buses. The area is gorgeous and inexpensive, with lots of other things to see nearby, however, so a car would have been helpful in that respect. The people there were just wonderful and I would love for them to see more business - their region certainly deserves it! We visited the WHS of the rock drawings as part of our trip through northern Portugal. The drive up the Douro Valley is beatiful anyway but I wouldn't have gone that far if there was no WHS. We had prearranged a tour with the park rangers and the Coa Valley turned out to be a beautiful and tranquil place. There were no tourists there whatsoever, good on one hand but whether the park will ever be able to economically justify itself, is doubtful. I have to admit that a good bottle of vinho verde attracts me slightly more than most of the rockdrawings we finally saw. One really has to be an anthusiast of rock drawings to appreciate them as much as our guide did. At the site near Vila Nova de Fozcoa where we've been the rockdrawings are few, they are tiny and difficult to see without being pointet to them. The antelope which became the heraldic animal of the park was detected here. Its about 10cm in size and so delicate that noone wearing glasses will be able to spot it without help. The whole place didn't meet my expectation level of rockdrawings. Maybe the other 2 sites nearby would have shown more. I don't regret having been there as it is a beautiful landscape, and if the rockdrawings were not detected a huge powerplant would be here today. The artwork itself hasn't converted me into a rockdrawings-maniac.